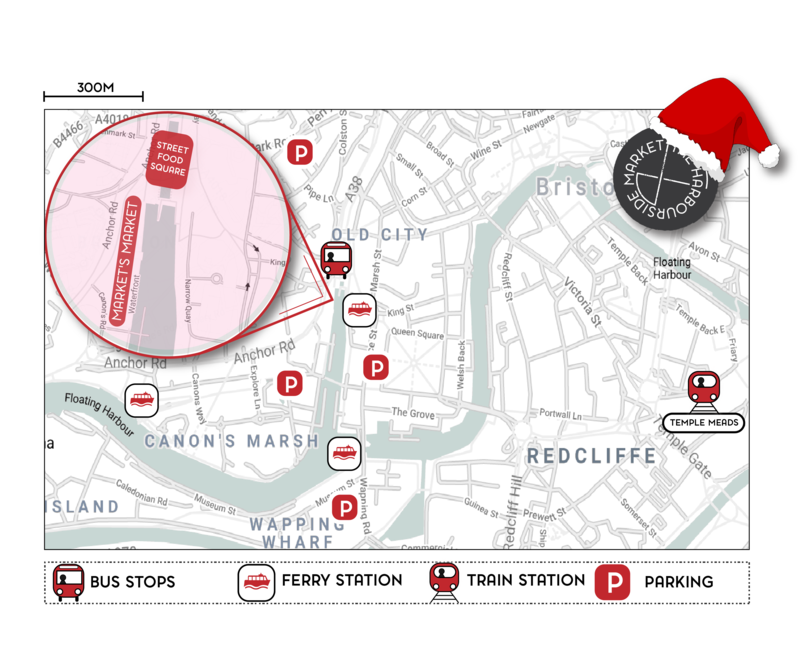 There are buses coming from every direction to the City Centre and they’ll all bring you close to the Christmas Market. The nearest stops are on Rupert Street or Broad Quay, which are a few minutes walk away. Check your route with the TravelWest website, here. Bristol Temple Meads Train Station is a pleasant 20-minute walk along the Brunel Mile to the Harbourside. Or to arrive in true Harbourside-fashion, you could catch a ferry from the station. Our friends over at Bristol Ferry Co. have got your water journey covered. Whether you’re taxiing from the station, sightseeing around the harbour or sailing with Santa, they’ll be able to deliver you in style to the market. They’ll be able to recommendations for our street food market too! You can find their timetable here. Arriving on two wheels is easy; you’ll find the market at the centre-point of Bristol’s always-improving cycle network and there’re plenty of bike racks to safely secure your steed. Bristol isn’t the most bike-friendly in the city for nothing! Head over to Better by Bike to plan a car-free ride. You might have heard, Bristol’s not the easiest place to navigate by car, so we recommend the Park and Rides – located on the outskirts of the city. If only four wheels will do, there are plenty of car-parks nearby; here’s our shortlist for the nearest and the cheapest. Nearest: Trenchard St – £5.50 for 4-hours. Cheapest: Wapping Wharf, £4.50 all day.